This is a synopsis of power quality case study regarding the installation of Distributed Electrical Energy Metering in the telecoms sector. The requirement was for a high accuracy metering system that could measure energy consumption on a number of site loads over a number of sites. A requirement for a distributed electrical energy metering was requested by a large telecoms company on a tender basis. Powerpoint Engineering Ltd were successful in the tender competition. 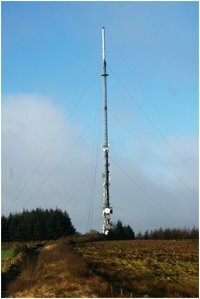 The requirement was for a high accuracy metering system that could measure energy consumption on a number of site loads over a number of sites. Each site had a number of cost centres. Each meter had to have multiple associations, i.e the cost centre, the type of load, the location of the meter. All meters consumptions had to be logged at 15 minute intervals from all sites back to a central location. User friendly energy metering software was installed at head office for accounting purposes. This system was to be retro-fitted on existing LV switchgear panels. Powerpoint Engineering Limited designed, supplied, installed, commissioned and supported a complete solution. 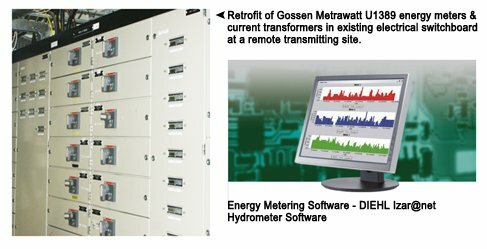 A combination of Gossen Metrawatt energy meters, Diehl Izar Center metering interfaces, Diehl Hydrometer energy metering software and Socomec Current Transformers were used. The system is currently monitoring all major transmitting stations for RTE and will continue to do so during the transition from Analogue to Digital Terrestrial TV.